Pilates and chiropractic are a powerful combination! 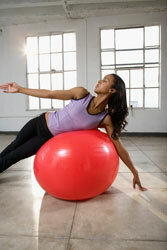 Pilates is a physical fitness system developed in the early 20th century by Joseph Pilates in Germany. As of 2005, there are 11 million people who practice the discipline regularly and 14,000 instructors in the United States. Pilates called his method Contrology because he believed his method uses the mind to control the muscles. The program focuses on the core postural muscles which help keep the body balanced and which are essential to providing support for the spine. In particular, Pilates exercises teach awareness of breath and alignment of the spine, and aim to strengthen the deep torso muscles. Pilates claimed that his method contains both philosophical and theoretical foundations. He claimed that his system is not merely a collection of exercises, but a method developed and refined over more than eighty-five years of use and observation. According to practitioners, the central aim of Pilates is to attempt to create a fusion of mind and body, so that without even engaging the mind, the body will move with economy, grace, and balance. Please contact us if you have any questions. Book your class online and begin to enjoy Pilates!